As Star Wars: The Force Awakens prepares to hit our screens in Dec 2015, fans around the world have already started getting excited for the next instalment. The iconic Millennium Falcon, perhaps one of the most memorable features of the original Star Wars trilogy, is making a return in the new movie, and parents everywhere will be secretly hoping that their child wants their very own Millennium Falcon. ​This was the toy that defined a generation, and it’s time for a new generation to see what all the fuss was about! 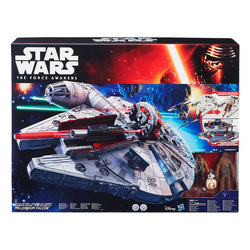 Is the Star Wars: The Force Awakens Battle Action Millennium Falcon Worth Buying? The most obvious difference between this Millennium Falcon and the toy that was on every child’s list for Santa in the 70’s is the two oversized nerf rockets that now defend the ship. While parents and ardent Star Wars fans will probably question their inclusion, nerf rockets are a welcome addition to any child in any situation, so it’s no surprise that they have included them here. The inclusion of 3 figures is also extremely welcome. In Chewbacca, you have one of the most important members of the Star Wars universe, and co-pilot of the Millennium Falcon. Finn is set to be the hero of the new film, so while some fans won’t be fully aware of who he is now, he is a main character and an excellent choice for figurine inclusion. Lastly, BB-8 the droid who looks to be an upgrade on R2-D2. These are not throwaway figures, and including them is a big plus. With pop open sections for the bridge and the gunroom, the Millennium Falcon is well suited to enthusiastic and creative play. The ship is well built and substantial in size, making it instantly attractive to most children interested in recreating a daring escape, a fight with the forces of the dark side or a lasts second jump to hyperspace! There is every chance that the Battle Action Millennium Falcon will be bought by just as many collectors as it is by parents for their children, so this could be difficult to put your hands on closer to Christmas. If you want to get one, you would be well advised to get it early, because there won’t be many left by the time the film comes out! • 5.2 x 22 x 16.6 inches - it's big!